And I recently came across the riviera cuff and LOVE it! Loving the colors of that scarf! Just saw that DVF dress and I love the style and color combo! Absolutely adore these choices. The sunglasses, the dress, the bag, the arm candy… perfection. Great finds! I love the leopard loafers! I've been eyeing that A. Wang bag for a while now. Especially love the beige version with rose gold feet! 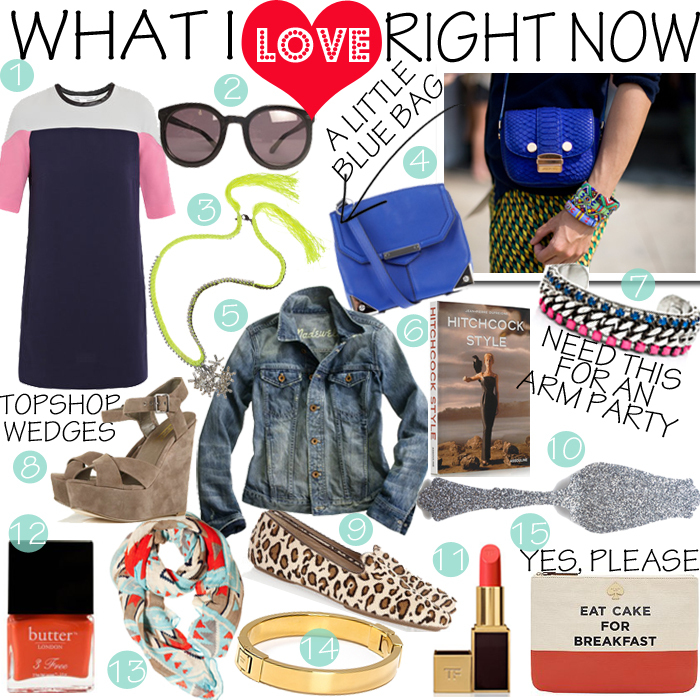 That jean jacket & those wedges need to make it into my wardrobe asap! I love the Michael Kors Gold Bangle – looks like the Cartier one but at a fraction of the price! Adore those topshop wedges! They'd be perfect with some tights now and bare legged for Spring! Great picks! I especially love the shoes and that server piece. Fabulous. LOVE those loafers, that lip color, that bag, and that cuff.